Finance Minister Euclid Tsakalotos warns that delays in implementing agreed reforms and measures with the country’s international creditors will maintain a climate of uncertainty and chip away at the country’s credibility ahead of Greece’s next bailout review.In an interview with Sunday’s Kathimerini, Tsakalotos said that the majority of government members were on board with the program, implying, however, that some appear unaware of the situation’s gravity. “We need a coherent program for the coming period,” he said, adding that the government must prioritize what areas it will throw its weight behind. “The program and its implementation is not a matter of a better or a worse cabinet, but one concerning all of SYRIZA’s political organization and the party, including MPs,” he said. Prime Minister Alexis Tsipras last week hailed Tuesday’s sale of Greek bonds, the first in three years, as a milestone on the country΄s way to exiting the crisis and international bailouts. The bond issue, which raised 3 billion euros, is “the most important message and the most significant step in order to finish this unpleasant adventure of the memorandum,” he said. 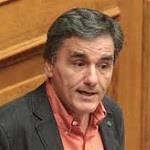 Tsakalotos echoed the premier’s sentiments and dismissed critics who – citing the bond’s slightly lower yield than the one in 2014 – said that Greece is essentially back at the same point it was three years ago. “It was a successful foray, as was denoted in the statements by foreign institutions [the European Central Bank, European Commission and European Stability Mechanism] and the media,” Tsakalotos said, adding that yields of the 2014 bond rose at a far higher rate. “Our future target is not just to reduce the cost of borrowing but to return Greece to normalcy with regards to market access, which will force borrowing rates in the private sector downwards and allow banks and businesses to borrow again on better terms,” Tsakalotos said. The minister also rejected a call by the International Monetary Fund (IMF) to expedite stress tests and for an Asset Quality Review, saying that the European Bank Authority and the Single Supervisory Mechanism have scheduled tests for European banks in 2018. “We believe that Greece must remain within the European framework, which is something the IMF tends to forget,” he said.